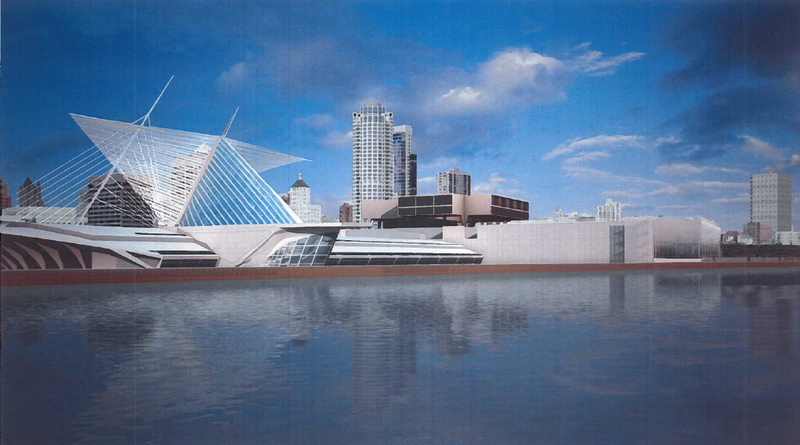 Many critics would argue that the War Memorial Center designed by Eero Saarinen is the city’s most important work of architecture, ranking it ahead of the Calatrava addition to the Milwaukee Art Museum. Yet the Saarinen has been allowed to slowly deteriorate. Worse, some of the resulting water seepage threatens the art museum’s collection of paintings, whose value is estimated at $1 billion. There is no similar concentration of great art and architecture to be found in Wisconsin, so you might think there would be great concern about fixing the problem. Curiously, that hasn’t been the case. The reasons for that begin with the bizarre governance structure of the War Memorial. Though the art museum occupies 70 percent of the space in the Saarinen building and the Kahler addition built in 1975, it does not run the buildings. Instead they are run by War Memorial executive director David Drent, who answers to the War Memorial Board of directors, the majority of whose members are appointed by the County Executive and County Board because the county owns the buildings. The War Memorial Board also runs the Marcus Center for the Performing Arts, the Charles Allis Museum and Villa Terrace. The reasons for this convoluted governance are historical, but as a September audit by Milwaukee County concluded, “there are six separate boards of directors” running these facilities. The audit offered a rough, “preliminary estimate” that repairs to the War Memorial and Kahler addition would cost at least $5.3 million. 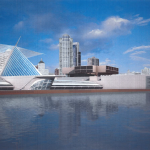 The document was signed by Drent and Daniel Keegan, Director of the Milwaukee Art Museum, who jointly promised to present a detailed response with possible solutions to the Milwaukee County Board by April, 2012. Drent, however, tells me he wants still more time, but won’t say how long is needed. Keegan says action must be taken as soon as possible, and that a comprehensive plan to truly assure the repair and restoration of the two buildings will cost $25 million. His plan calls for the museum to raise $15 million and the county to kick in $9.8 million, and for the museum to assume operation of the War Memorial, to assure it doesn’t fall into disrepair in future years. The Veterans will be displaced: County Supervisor Michael Mayo blasted this plan as a “hostile invasion” by the art museum and called on the interest of veterans to be protected. Other board members suggested the museum and veterans groups should negotiate over control of the War Memorial. In fact, the veterans have little control over the War Memorial. They now appoint just one member of the War Memorial board. As the county audit noted, activity at the War Memorial is “heavily tilted” toward non-veteran activities, with veterans activities accounting for just 20 percent of facility rentals and 11 percent of the office space used there. Veterans weren’t consulted: As Mayo put it, they were “blindsided by surprise attacks.” Mayo offered not one example of a veteran who felt this way. Keegan says the art museum ran its plans by all the constituent groups overseen by the War Memorial Board, including the War Memorial veterans board, a kind of advisory board. “The veterans have said they don’t care one way or the other about the building’s governance,” Keegan says, “they just want the War Memorial to be preserved.” Drent concedes that the veterans group liked the museum’s plan. As to whether the veterans were concerned about the proposed governance change, Drent said “I can’t speak for the board.” Given that he opposes and could lose his job under Keegan’s plan, you can bet Drent would present any evidence the veterans board was on his side. 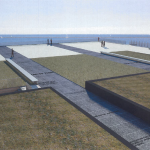 Keegan’s plan calls for renovation of Fitch Plaza, a memorial to veterans toward the rear of the War Memorial, which has been neglected for years. It would become a memorial garden and green roof with paths leading toward a dramatic view of the lake. Veterans, he says, loved this idea. The plan includes a new building: JS reporter Mary Louise Schumacher called it a “glassy new addition,” a “new structure” that would cost $5 million. That’s sort of accurate but conveys the idea this is a new building. 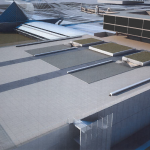 It’s really just a refurbishing of two parts of the Kahler addition: the open air sculpture garden in the middle will be given a roof, to end water seepage problems and eliminate the hole in Fitch Plaza, much of which sits on the roof of the Kahler. The renovation will also give the building a new East face, a glassy atrium that will replace the old glass wall that has leakage problems and allows no entry for visitors. As the price tag suggests, this is just a renovation of an existing building. The art museum is at fault for repair problems: This misleading claim was made by county supervisor John Weishan, who released a press release suggesting the county could have spent money to fix the War Memorial if the art museum would “simply start paying its utility bills” for use of the structure. Weishan doesn’t know his history. The War Memorial was created in 1957 with the dual purpose of creating both a veterans memorial and a home for what was then known as the Milwaukee Art Center; indeed, the lakefront project was originally supposed to include a performing arts hall as well, which was moved to Water Street and is today known as the Marcus Center. The county pledged to maintain this home for the art museum but in the last decade has slashed its support by more than $400,000 annually, as the audit noted, leaving the museum to make up the difference. Separate management is needed for the War Memorial: The county audit blew holes in this theory, by noting the potential to consolidate staff at the War Memorial and museum who now separately handle maintenance and engineering, facility rentals, parking, marketing and events planning. It also raised questions about the War Memorial’s management, noting that its parking system was “antiquated,” lacked sufficient control over cash collected, and charged “below market” rates. Other than preserving Drent’s job, it’s not clear why the War Memorial needs separate management. Moreover, it makes no sense for the War Memorial board to be overseeing the Marcus Center, Charles Allis Museum and Villa Terrace. All three entities have asked to end this unwieldy governance structure, and the move is long overdue. The reality is that both the city’s foremost veteran’s memorial and the community’s collection of $1 billion in art is gravely threatened by the deterioration of the War Memorial and a governance structure that makes no sense. This is not about the veterans versus the arts, but about better serving both groups. -If you missed the big battle of AlderBobs Donovan and Bauman, check out Jeramey’s amusing story on it. -And yes, I’ve joined the tweeting, twittering masses. You can follow my opinions at Twitter at BruceMurphyMKE. Although I’m not a big fan of the War Memorial architecture, the condition of it and the additions are terrible and deserve to be elevated to the status they deserve by renovation and a governing system that is willing and able to take the responsibility to do so. Does Drent have to lose completely his job or is it simply a loss of power and control that he wants to avoid? The museum has made no suggestions regarding Drent’s job, but if the museum takes over management of the War Memorial, his status would likely change in some way. Good story, never heard it before, but everything that goes on in Milwaukee is ridculous and entertaining. It’s just incredible how stubbornly the County Supervisors try to cling to the status quo. Any notion of change at the County level – even change that has the potential for substantial improvement – is instantly batted down with some straw man argument, false populism, or outright aggression. Here is an absolute no-brainer – if the Art Museum is going to front $15 million, obviously they are going to want some level of control. It really makes you wonder what Weishan and Mayo’s gain is in this situation. It’s just sickening how significant of an obstruction County politics are in Milwaukee. I audited the War Memorial and other facilities many years ago and recall wondering what connection existed between the War Memorial and the Marcus Center. Thanks for giving the background and history behind these organizations. Your article is so much more informative than others I’ve read. Good to get the real facts behind things from someone who does their research and fact-checking! That the management structure of the War Memorial Center include active members of The American Legion and other representatives so as to ensure the preservation of the memorial and monuments there located for their intended purpose and mission in perpetuity. It takes my breath away to read a respected art commentator with such high standards declare this building to be Milwaukee’s best. I’m not very good at deciding my favorites, because many good things have many good reasons to be loved. But I’ve held in my dreams the original vision of the Saarinen – that soaring structure, cantilevered as if wanting to stretch across the lake. I remember a gathering of twenty-somes and a picnic underneath the awesome flight of concrete. Then that view was gone when the barn was inserted rudely underneath, a forced entry to collect on a promise of an art collection from a doting patron. While the city made out like “bandits” in getting to own all that art and enlarge its display, I learned how some gifts come with strings or consequences. Her legacy will be redeemed if we address that acre of asphalt too close to the water, an asphalted eyesore. Plant grass and flowers there again, a fitting lai of color to surround the Vets monument and the War memorial. Let it be so tended for a hundred years; let time heal; let time sanctify the memories of those who loved and gave so much.